While german shepherds are well known for being loyal companions and expert guard dogs, this particular video shows an even softer side to these adorable dogs! This gentle german shepherd watches over baby ducks in this animal loving home and it is the sweetest sight ever! 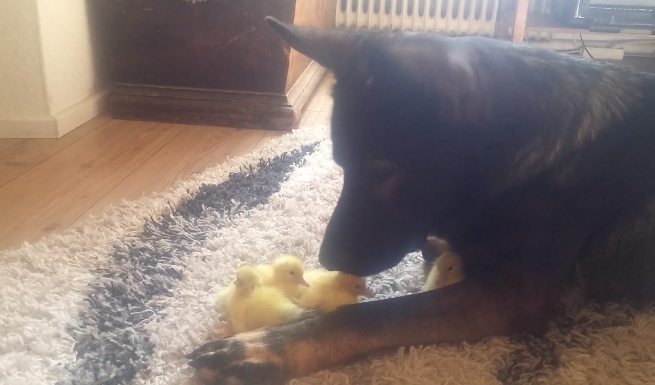 You can practically feel the waves of sweetness and parental love flowing from the german shepherd for these little ducklings. Get ready to have your heart melt into a giant mushy puddle of feelings! You’ll want to go and hug your furry friend immediately! Speaking of adorable german shepherds, in case you haven’t had your fill of these precious dogs here are two german shepherd siblings who are just adorable when they’re confused! We’re not sure what it is exactly that has these pups so puzzled, but it’s too cute to see that they both have the exact same reaction to the confusion!